When standing at the till waiting for an assistant I could hear them talking in the storeroom and had to wait. When someone did eventually come out they continued the conversation with their colleagues and apart from asking for the cost of my shoes for payment didn't acknowledge me in the slightest. I have worked in retail and consider this very rude. As usual excellent, friendly customer service. The ladies in this store are always helpful and patient no matter how busy the shop is taking time to offer advise and check stock availability if needed. Cashier: Sue, Was very rude while I was looking at items telling me to make my mind up so she didn't have to come back to the Till again. Didn't help when needed. I work in retail and was disgusted at the service I got. Will NOT shop at this branch again now. My wife and I came to the store early Wednesday morning for a pair of ankle boots for her, the only staff member there was Sue who was putting out the outside stock, I asked if she was open and she grunted that we could go in. While we looked for ankle boots the phone went where she promptly began speeking to a friend about her few days away at a wedding in Ireland which would have been fine except she carried on the conversation while we chose and then even while taking our card payment for the boots which we are pleased with. 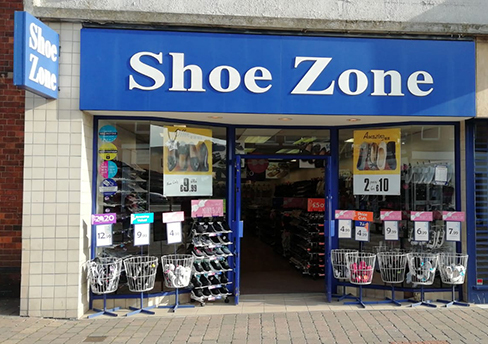 We have shopped for shoes for us and our grand children for a long time with Shoe Zone but that was the last time we will go there to buy anything as I was very dissapointed with the service we got to the point of being down right rude in my opinion. Store is clean, easy to reach as on pedestrian precinct. Good choices and prices. Over the last couple of days I have visited the store in Goole and to be frank found the customer service very poor from two different sales assistants. I felt as if neither of the staff could be bothered, were not particularly friendly, in fact i thought they were a bit abrupt. Today I returned the trainers I bought on Friday for a different size and was asked if they were any on the shelf and told to go get them. I did get a size nine pair that were on the shelf together and handed them to the sales assistant, they were scanned and given to me with a receipt and not in the bag I returned them in' when I left there was no thank you or good bye returned to me. When i returned home I realised that they were both right footed. I don't feel like returning them now and I am going on holiday f or 2 weeks tonight. I am sorry for the negative feedback and it is something i don't generally do but I am not a happy customer.